Olympic carpet with anamorphic effect! 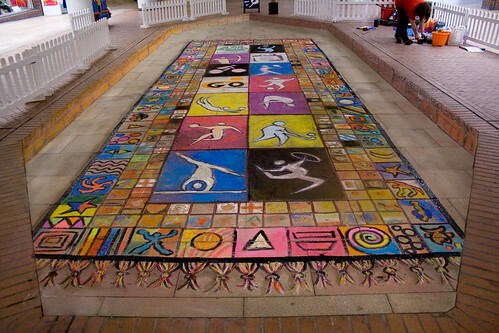 Gravesend olympic carpet with anamorphic effect, originally uploaded by urbancanvas08. Heres a photo following on from my last blog of our finished Olympic Carpet of Dreams…..done for Gravesham Borough Council’s build up to the London Olympic Games 2012. Anamorphic art can create 3D effects if viewed from the correct angle. Anamorphic Street Art has been made popular today through the 3D art of artists like Julian Beever and Kurt Wenner but the idea is not new to art and was even practiced by Michelangelo! 07 Jun	This entry was published on June 7, 2010 at 12:45 pm. It’s filed under arts, culture, street art and tagged 2010, 2012, 3d, anamorphic, art, artists, arts, borough, canvas, chalk, chalking, chalks, council, games, gravesend, gravesham, kent, olympic, painting, pavement, public, street, urban, urbancanvas, workshop. Bookmark the permalink. Follow any comments here with the RSS feed for this post. Older: An Olympic Carpet of Dreams…….